Absolutely no new materials, only reclaimed and/or repurposed from another, preferably more practical, utility. Smug Scout did not know that all of the grounded lobster traps she sees all over the place in NH and Maine were waiting to be reclaimed and repurposed; she thought they were just regional outdoor decorations, sort of like the dead, rusted out cars on cinder blocks one sometimes sees in less sophisticated Smug-repellent rural or blue collar neighborhoods. So she may be ignorant about all practicalities related to lobster traps, but she does know that chairs made out of them offer a punitive discomfort. They do not have cushions or even contours, though the back meets the seat in a way that is somewhat curved to fit a human body–as long as that body is made of Jell-O. Smug Scout believes it would feel like sitting Indian style on a sewage grate. Even Eames wire chairs appear plush by comparison; at least they are sculpted and have leather seat pads made specifically for them. 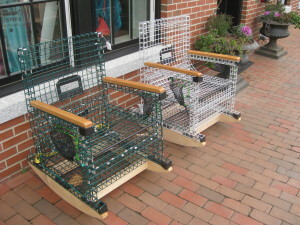 In fact, the only difference between “Lobstah Rockahs” and medieval torture racks is that the former do not feature spikes and do come in six fashion colors with contrasting mesh drink holders (ideally proportioned for the bottle of vodka you will need to dull the physical pain from your sitting experience). Smug Scout cannot think of who would truly enjoy sitting in a “Lobstah Rockah,” but she believes that the chairs’ biggest fan base would be actual lobsters, who would be only too delighted to find their underwater death chambers turned into pricey furniture. Smug Scout did some research and found that the company making these lobster trap chairs is called Sea Rose Trap Company from Scarborough, Maine. Naturally, she was fascinated by the descriptions she is reproducing below in red (of course, right?). Her responses remain black. Sturdy and comfortable, these lobster trap rocking chairs are made to last! Pressure treated rockers, vinyl coated wire, and poly twine will all withstand the elements for years to come. Each rocking chair has all the details you’d find on a real lobster trap. This is the genuine article! Smug Scout is very confused about why “all the details you’d find on a real lobster trap” are a selling point for a rocking chair, which is supposed to provide a relaxing experience rather than an entrapping one. Smug Scout is also confused about the writer’s use of “on” rather than “in” here, but she knows this type of nitpicking makes most people cross. The latest addition to our product line – The Lobstah Rockah™ Loveseat. Now you can enjoy all the benefits of the Lobstah Rockah™ with anothah! Durable and weather resistant, this loveseat is made with vinyl coated wire and has pressure treated rockers. This chair has every detail that you would find on a real lobster trap. Do not assume that Smug Scout has no romantic fantasies set in New England; she has many. You will not be surprised to find out that these tend to feature reclaimed wood, especially birch and knotty pine. Not one of them, however, features either a “Lobstah Rockah Loveseat” (to put you in the mood for an…altahcation?) or a phonetic transcriptionist who turns “another” into “anothah.” Smug Scout is happy to listen to New England accents, but transcribing them is another story. All this “lobstah” and “chowdah” and “steamahs” nonsense is just gimmicky drivel meant to sucker punch rube tourists from newer (read: inferior) states. She does laugh when she sees NE residents write “scollops,” though.